I’ve only now recognized the mad genius of this picture. Yes, for years I loathed Fear and Loathing in Las Vegas as an unruly carnivalistic and pointless exercise in excess and glorification of drug use for comedy. I could never see the creativity or challenge in dramatizing a drug trip. Sure, this new Criterion Collection version of the film is probably the best it’s ever looked, but somehow the maniacal, giddy camera work of Terry Gilliam along with the equally maniacal performances from Johnny Depp and Benicio Del Toro have now tuned me in and turned me on. Fear and Loathing is a carnival and should be enjoyed as such. It’s an event of pure and harmless visual pleasure, a fun ride through the psychedelic ‘60s. As Raoul Duke (aka Hunter S. Thompson), we see Johnny Depp in a role tailor-made to his brand of stardom. Depp is not so much an actor as a performer. He will likely never win an Oscar because he fits best into caricatures of people. Think of his best performances and arguably all of them are covered up with actor’s business or over-the-top/grotesque make-up of some sort. Depp, wearing a bald cap and bounding through Gilliam’s wide-angle frames twitching with paranoia, is so darn pleasurable to watch. And that’s really the only way to analyze this. Del Toro is even more startling, sacrificing mind and body in portraying Duke’s lawyer, Dr. Gonzo. Not only does Del Toro pack on a good 40 pounds of natural unenhanced flab, his manic and aggressive hallucinations while tripping on drugs is terrifying. Gilliam admirably peppers in numerous cameos, including Mark Harmon, Tobey Maguire, Ellen Barkin and Cameron Diaz along the way. It’s a roll call of celebrities that fits perfectly with the glitzy Vegas background. Along the way, Gilliam admirably conveys Thompson’s sharp critique of the American dream and the fallacy of the drug movement as a means to free one’s mind. Instead, he shows the substances debilitating their abilities and stunting their potential. Thankfully, there isn’t much of a ‘message’ to sober us. Via Gilliam and Hunter S. Thompson, and through the safety of Blu-ray, we can freely enjoy the fruits of their drug experimentation and engage in the hallucinatory experience of LSD, ether, mescaline, cocaine and adrenochrome without ever trying them. Considering the horrifying experience of our heroes, I will forever stay on this side of the TV and trip out only by proxy. 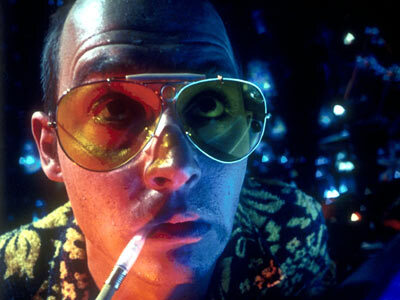 Fear and Loathing in Las Vegas is available on Blu-ray from The Criterion Collection.